EAGLE COUNTY —The Flying Eagle Disc Society, Eagle County’s disc golf club, is proud to introduce the inaugural Flying Eagle Open disc golf tournament presented by Bonfire Brewing. This will be a PDGA C-Tier event featuring two rounds of golf on two separate courses, and is set to take place on Sept. 26 and 27. Registration opens on Tuesday at 9:30 p.m. via the Mile High Disc Golf Club website (http://www.mhdgc.org). Spots for the event are expected to fill fast. 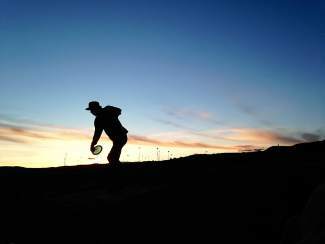 Round one will play at the newly renovated Hole in the Sky Disc Golf Course at the Eagle County Fairgrounds in Eagle. Round two will take place on a championship-style, temporary layout at the picturesque Gypsum Creek Golf Club in Gypsum. This is a rare and special opportunity to play a tournament round of disc golf in a traditional golf course setting and the first ever professional tournament in Colorado to do so. Both rounds will be run with assigned tee times for each player and both courses will feature alternate tee positions depending on division. Open and advanced will play from the long tees while intermediate, recreational and juniors will play from the short tees. Amateur players can expect to receive a robust players pack, and there will be payouts to top finishers in all divisions (cash in pro and prizes in amateur), in addition to trophies for top players in each division. Hole in the Sky DGC is a permanent, public course and will be open for practice rounds from sunrise to sunset until the day of the event. Gypsum Creek will have a limited practice and preview window with the course open on Sept. 26 from 4:30 p.m. to sunset. Access for the practice session will be first-come, first-served. Golf carts will be available to rent for the practice session but will not be in use during the competition round. The Flying Eagle Open disc golf tournament is open to all interested players regardless of age, gender or ability. All divisions will be available with entry fees ranging from $30 to $65 depending on division. Free camping will be available on-site at the Eagle County Fairgrounds. Participants who wish to book a hotel room in Eagle should do so quickly as demand will be high due to other events in town that same weekend. Supporting partners include Eagle County, Gypsum Creek Golf Club, Stoneyard Distillery, Larkburger, Transition Sports, West Vail Liquor, Dynamic Discs, Mile High Disc Golf Club and Throw Colorado Community. To sponsor the tournament, contact the tournament director, Steve Klehfoth, at info@flyingeagledisc.com. For complete details, visit the Flying Eagle Disc Society website at http://www.flyingeagledisc.com.